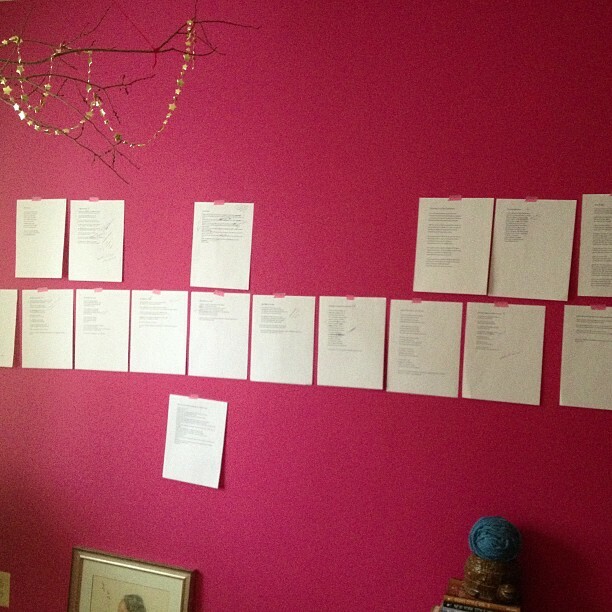 My next book’s a work-in-progress…just like moi. Temps notwithstanding, spring really has sprung. At least that’s what I’m attributing my cleaning jag too. Clearing out the “junk drawer” of one of my filing cabinets, I’ve come across quite a few treasures: copies of the first NEA Arts magazines I wrote by myself, an interview I did with a food historian for American Spirit, a mini-collection of music poems that must have been the hand-out at a now-forgotten workshop, Maureen Seaton’s reading list from the very first poetry workshop I ever took, the essay I wrote to get into grad school, a profile in the MFA newsletter from my first year in the writing program. I’ve just finished reading a stack of e-mails I’d printed out from when I was on sick leave from work with pneumonia from December 2005-April 2006. I’m both tickled and alarmed by the fact that even as I sent my boss updates on my clearly deteriorating condition, I continued to also give her updates on all of the work I intended to do while I was on sick leave.. Here’s a sample, from January 2 (which I think was a day or two before I was admitted to Adventist Hospital for a week). Did I mention that at this point I’d been diagnosed with walking pneumonia? I feel guilty about time off. I remind myself often that we have an allotment of sick days for a reason. That my lungs are still damaged from my 2006 illness and no one expects me to trudge into work on 100-degree days. No one’s surprised when allergy season comes along and I have to take time off because my asthma’s acting up. I know the whole spiel about taking time off to take care of ourselves so that we don’t end up with something worse. And still, I feel guilty. I come from a long line of women who can’t sit still. They are always sweeping something or cooking something or washing something. Even when they’re sick or exhausted, chores have to be done. Their lives seem to revolve around action, not thinking. If you’re not actively doing something, then you’re wasting time. I live a life of the mind. I’m thinking about poems, about PR campaigns and interviews for work, about what I want to tackle next in my ongoing practice of self-improvement. I may look passive, but mentally, emotionally, I’m hard at work. I’ll cook, clean, and wash as much as I need to so I don’t live in a total pit, but I’d rather read a book or watch a good TV show, whatever gets me to a thinking place. Still, though I intellectually know I’m doing something, my DNA keeps telling me something else. And because I’m already carrying around this guilt that I don’t do enough, when it becomes imperative that I not do anything due to illness, the guilt intensifies. Sigh. While I have learned that I need to relax and take days off and enjoy them, I’m still working on not having to spend those days shushing the chorus of “I shoulds” yelling in my brain. And now as I’m easing back into full-time work, I have to keep reminding myself that I should, in fact, be “easing” back into it. Sure my outside incision has healed well, but there’s still numerous incisions inside of me that are aggravated every time I bend over, or take a walk, or go up a flight of stairs. I have to remind myself to check in: How do I feel? Am I in pain? Am I tired? I still have another week at home telecommuting. And I’ve promised myself that once I’m commuting to work again, if I’m overly tired at the end of the day, I’ll work out an arrangement for a few weeks so I can continue to telecommute a few days a week until my strength’s back and riding the Metro doesn’t make my insides ache any more. And maybe, just maybe, I won’t feel guilty about it. Posted on March 24, 2013, in Uncategorized and tagged convalescence, guilt, housework, illness, recovery, work/life balance, writing, writing life. Bookmark the permalink. 1 Comment. I hope you get well soon. I am asthmatic too and quite hate it when it decides to show up and upset the balance of my life.